All aesthetic judgements are political, but some are more political than others; and if you cannot conceive of great art made by people whose political opinions you do not share, then just maybe you cannot conceive of art at all. It was ironic that the Irish Times released their Theatre Awards shortlist just after the death of Alan Rickman; whose performance in John Gabriel Borkman the Guardian valorised as one of his great stage achievements; as it drew the mind back to the Irish Times’ magisterial pronouncements on the state of Irish theatre in 2010. John Gabriel Borkman, a co-production between the Abbey and Southbank’s National Theatre, premiered in Dublin before transferring to London, and eventually Broadway. 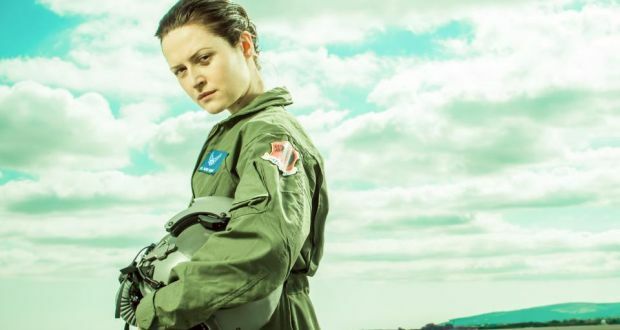 It was seen by around 20,000 people, got rave notices, and received … two nominations from the Irish Times: for costumes and set. Meanwhile World’s End Lane, which could be seen by 3 people per performance, and so was seen by almost a hundred punters, as opposed to John Gabriel Borkman’s 20,000, received a nod for best production. And of course you ‘couldn’t’ sputter with outrage over this because, inevitably, you hadn’t seen World’s End Lane. 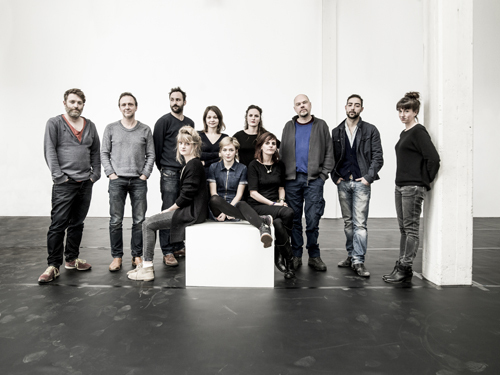 Thus has it been lately with the Irish Times Theatre Awards. Such hipster valuations of theatrical worth downgraded the Gate and Abbey, and combined with a persistent boosting of Belfast’s Lyric Theatre, and companies and plays that shared the politico-cultural preoccupations and prejudices of the Irish Times. Conall Morrison directs his second consecutive Abbey Christmas show, but with a less fabled script than She Stoops to Conquer the result is less sparkling. Struggling dentist Valentine (Paul Reid) extracts his first tooth from a paying customer with relief. Said paying customer Dolly (Genevieve Hulme-Beaman) invites him to lunch at her seaside hotel, a proposal loudly seconded by her equally forthright sibling Philip (James Murphy). Through a series of Shavian coincidences he ends up bringing his bitter landlord Mr Crampton (Eamon Morrissey) as his guest, and Mr Crampton turns out to be the husband that Mrs Clandon (Eleanor Methven) ran out on; and whose identity she has refused to reveal to her children Dolly, Philip, and Gloria (Caoimhe O’Malley) as none of their business… Luckily Finch McComas (Nick Dunning), an old friend of both warring spouses, is on hand to mediate. And redoubtable waiter Walter (Niall Buggy) is on hand to smooth over any marital strife and hurry along Valentine’s impetuous courtship of Gloria. You feel Shaw would not remember specifically writing the two most memorable elements: Liam Doona’s set, a circular playing space encased by a moat with two drawbridges, and Walter given to bellowing “THANK YOU SIR!” at patrons from a distance of inches. The former is playful (and wonderfully matched by Conor Linehan’s jaunty incidental music), the latter begins baffling, becomes endearing, and ends hysterically. It also underpins Walter’s almost tearful acceptance of drinks orders in the finale lest he lose his waiting existential raison d’etre by sitting down. Elsewhere the direction is less sure. As regular theatre cohort Stephen Errity noted a very different version of this play exists in which, rather than Morrisey’s befuddled old geezer, that you feel sympathy for God love him, you get the Nietzschean Crampton (‘Dost visit with women? Remember thy whip!’) other characters recall. There’s also, by Shaw’s own hand, Major Barbara, in which he successfully reworked in 1905 some of this 1897 material. Methven’s part thus becomes the even more acerbic Lady Britomart, which she played on this stage in 2013. O’Malley, who slightly overdid the girlishness in the Gate’s recent A Month in the Country, is magnificent here as imperious Gloria who goes comically to pieces under the pressure of Valentine’s impudent courtship and Crampton’s badgering. Reid is insouciance personified, while Dunning is amusingly overwhelmed, so Hulme-Beaman and Murphy provide the bombast. That is until Denis Conway appears… Joan O’Clery’s designs reach their apotheosis of spectacle in a costume ball, which allows Morrison again end on a musical number, and swishing about in a cape and medico della peste is Conway as the lawyer Bohun who will sort out everything with epigrams. Shaw might as well have written ‘Enter Bohun. He Fassbenders’. You Never Can Tell loses its way after the interval but Morrison’s general air of good humour sustains it until Shaw realises he needs some vim and introduces Bohun. 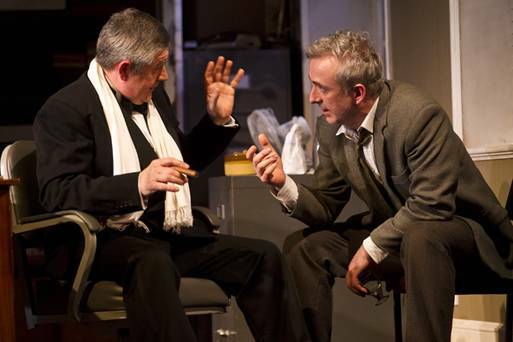 You Never Can Tell continues its run at the Abbey Theatre until the 6th of February. Director Patrick Mason reunites with Marty Rea and Rory Nolan, the double act from his 2009 production of The Rivals, for an elegant production of Wilde’s comedy of dual identities. Designer Francis O’Connor spoke in his Gate Lab talk of producing a space of ‘vivid neutrality’ hiding playfulness and tricks; from Oscar’s visage faintly imprinted on the back wall, to a toy train running on tracks laid into the floor for Act 2’s shift to the country, to the startling ejection of rows of champagne or filing cabinets from a side wall when given a push. Panels in the back wall open to reveal Algy’s vases full of perfect green carnations, bucolic countryside impressions, and Jack’s massive portrait of Queen Victoria surrounded by eminent Victorians. O’Connor’s costumes visually cue Mason’s take on the characters: Algy is the perfect aesthete, his blue suit perfectly fitted to his decor, Gwendolen is a chip off the old block, her lavender outfit a variation on her mother’s dress, and Jack is trying too hard to pass as an Establishment worthy, his dark clothes always too sombre. Even Jack’s servant is off. Lane (Bosco Hogan) is in insouciant synch with Algy, but uncertain Merriman (a Fassbendering Des Keogh) is nearly clobbered by filing cabinets, makes heavy weather of clearing away Cecily’s books to lay the table, and runs away whimpering after serving Gwendolen detestable tea-cake. It’s instructive to note the Rea/Nolan double act’s contrast to Shackleton/Murphy in Smock Alley’s recent Earnest. The business of the last muffin here sees Algy magnificently insouciant and inert, not mischievous and active, with Jack’s despairing throwing of a handkerchief over the muffin tray, rather than engaging in a tug-of-war for it, summarising Rea’s interpretation. This is a man at pains to be respectable but continually thwarted by others. 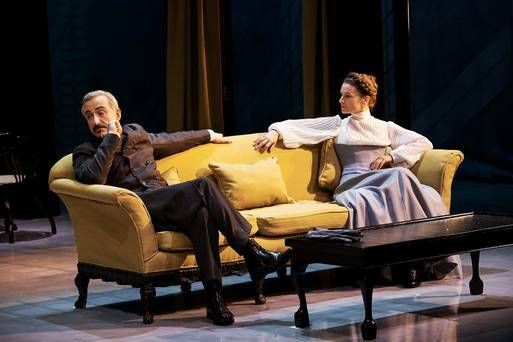 Pushed on to the ground by Miss Prism (a droll Marion O’Dwyer), he attempts to muster an entirely imaginary dignity before asking Lady Bracknell if she’d mind awfully telling him who he is. Rea’s expression when Jack finds his real name in the Army Lists is a comic joy. Donnelly is a wonderful Lady Bracknell, eschewing outright scenery chewing for a forthright indomitability that makes quotable lines fresh putdowns, while Dwyer Hogg, the polar opposite of her Heartbreak House ingénue, vamps it up as Gwendolen, with a Brackenellian imperiousness towards Cecily. Mark Lambert, so rambunctious in that Heartbreak House, seems underused as Canon Chasuble; amusingly rendered a relation of Peter Cook’s Very Impressive Clergyman; but complaining that supporting players have too much star power clearly points to an embarrassment of riches. Mason had wondered what he could bring to another production of Earnest; the answer was reforming an unbeatable trio of himself, Rea, and Nolan. The Importance of Being Earnest continues its run at the Gate until the 30th of January. Smock Alley presents a spirited production of Oscar Wilde’s classic comedy in which the setting of Victorian drawing room and garden receives an unusual interpretation. Marcus Costello’s startlingly green set serves as garden and drawing room with shrubbery in the shape of a piano revealing itself as a functional piano. There is also the added surreal touch of dresses hanging with lights inside them as eccentric garden decoration. Olga Criado Monleon’s costumes foppishly cast Jack in beige and Algy in blue, but excessively render unfashionable Cecily in a dress that’s almost a repurposed table-cloth. Initially you fear that director Kate Canning is attempting a Jordan-style queering of the text, but that approach quickly dissipates; though Charlie Hughes playing Lane, Merriman, and Canon Chasuble, leads to a major quibble. Lane is rendered with a jiving walk that’s as disconcerting for the character as Jeeves being played as Riff Raff, and Merriman becomes Worzel Gummidge, for the purpose of physically differentiating from Hughes’ main role as the entertainingly nervous Canon. O’Byrne also overplays vocally the girlishness and exaggerated innocence of young Cecily to contrast Duggan’s sultry Gwendolen. And yet such complaints stand as naught against the whole production, as any gripes are swept away by the accelerating comedic momentum of Wilde’s script, and a deluge of delirious nonsense from the double act of Jack and Algy. Canning contrives some wonderful business. Jack and Algy engage in a tug of war for the silver tray bearing the coveted last muffin as Jack grunts his pained dialogue, while Katie McCann follows up one of her deliciously fake social laughs as Miss Prism with a death-stare at Jack and Algy for their effrontery. Shackleton and Murphy faced the challenge of playing roles that Rory Nolan and Marty Rea take on in a few months in the Gate’s production, and they can proudly boast that they equalled that proven double act in moments such as Jack first meeting Algy at his country estate. Duggan meanwhile adds knowing sauciness to Gwendolen’s dialogue that unnerves Jack terrifically, and seems to rediscover Wilde’s subversiveness. Plays that are as quotable and almost over-familiar as Wilde’s offer their own hazards, and it is to this company’s credit that they sparkle. 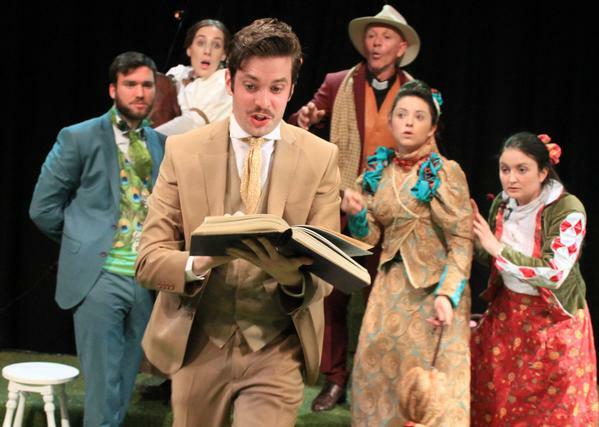 The Importance of Being Earnest continues its run in Smock Alley until August 22nd. Frances Ha director Noah Baumbach returns to the NYC art scene, but loses Greta Gerwig as co-writer and reinstates Greenberg cohort Ben Stiller as protagonist. Josh (Ben Stiller) is a documentarian. He’s married to Cornelia (Naomi Watts), a film producer, whose father is the legendary documentarian Leslie Breitbart (Charles Grodin). Josh and Cornelia’s best friends Fletcher (Beastie Boy’s Adam Horovitz!!) and Marina (Maria Dizzia) have just had a kid. Indeed the misleading opening finds Josh and Cornelia gazing at the baby while a mobile playing a cutesy version of Bowie’s ‘Golden Years’ hangs over the cot. Having lost Fletcher to the children cult Josh is receptive to a hipster couple he meets after one of his New School extension lectures. Jamie (Adam Driver) is a would-be documentarian, his wife Darby (Amanda Seyfried) makes home-made ice cream, and they live in a Brooklyn flat with friend and occasional band-mate Tipper (Dree Hemingway). Josh is enchanted, and soon so is Cornelia, but can this rejuvenation end well? While We’re Young is less sunny than Frances Ha, but thankfully not as bitter as Greenberg, and, from the opening hilarious quotes from Ibsen’s The Master Builder, is always engaging. Some montages of Josh and Cornelia’s rediscovery of their youth thru hip-hop and hats equal Frances Ha’s use of pop, and Baumbach also mocks ‘Eye of the Tiger’ motivational status (“I remember when this song was just bad”). But Frances Ha was about being lost and aimless. This is about a couple who have everything, and are jaded, meeting a couple who have little, but are liberated. Josh has spent 8 years not finishing a documentary, and laments “I only have two moods: wistful and disdainful.” For Jamie making a documentary is a free and easy process, as whimsy-driven as choosing to not know a factoid rather than google it. But when Jamie uses a remote control to zoom-in for a close-up on his face during a ‘spontaneous’ tearful scene when interviewing old school-friend Kent (Brady Corbet), Josh realises Jamie’s directing is as affected as the love of vinyl and VHS… Then things get All About Eve as Jamie supplants Josh in the affections of Leslie (veteran Grodin on fine comedic form). 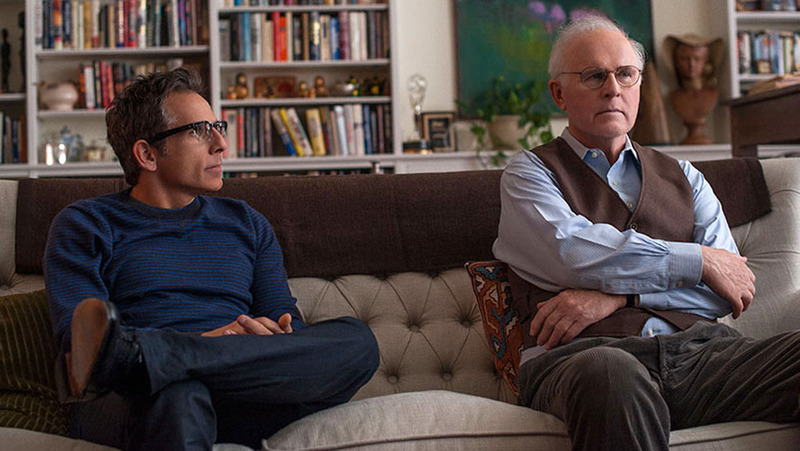 It’s a bit silly, not least as it draws attention to Baumbach’s own idol-supplanting. Josh is Woody Allen in Crimes & Misdemeanours: a film-maker unable to finish a documentary showcasing an aged academic proffering arcane wisdom. It’s as odd as James Murphy’s music and Baumbach’s staging creating an oddly sinister intercutting of a valedictory speech and an ethical confrontation, almost as if Baumbach is parodying his own concerns: Woody’s stakes were life and death, his, just passé ethics. While We’re Young has moments of genuine sadness, like Cornelia (who’s miscarried repeatedly) freaking out a baby music class, but Baumbach opts for an all too pat comedy ending.